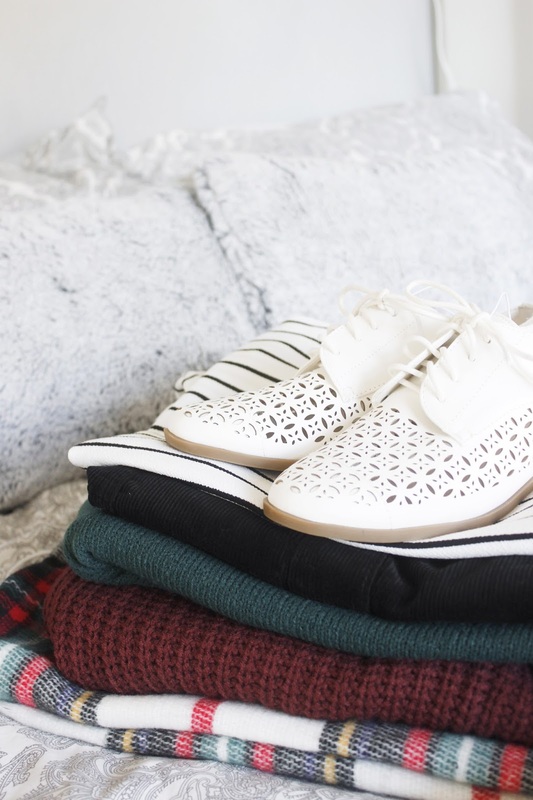 Autumn/Winter is a favourite for most bloggers & I'm not an exception! For those of us living in the UK, we're so used to our roller coaster seasons so I don't think you can do much prep when it comes to these seasons as they've been part of my wardrobe all year round - I mean, other than purchasing more knitted jumpers and all those beautifully scented candles. Do you want to know my favourite part of this season? The cold! The freezing cold, the need to wrap up before leaving the house and that overall cold feel in the air. With the cold, comes the clothing. All the little bits we purchase or have stashed away ready and today I'll be sharing my Autumnal Fashion Picks! STRIPES. Alright, I admit stripes are an all year round obsession for me. In the last couple of months I've purchased more stripes tops and t-shirts than I have done before. Something so simple yet effective, my stripes vary from boyfriend t-shirts > patch-work tops > knitted jumpers. The design works with countless styles - I'm currently on the hunt for shirt dress or long-sleeved t-shirt dress and my collection might be completely (not really). What I like the most about stripes is how versatile they are; if I'm having a lazy day, easy. If I want to dress up a little, it works. Stripes are a style which won't go out of fashion any time soon and is my favourite go-to look. COATS. I've lived for my leather jackets for as long as I can remember. I'm currently wearing a leather biker jacket - with a detachable fur collar. However I tend to purchase a new one every couple of years, and although I've got my leather favourite I'm always looking out to try new styles. Obviously coats and jackets are a must have for this season, but I definitely get excited by the thought of a new purchase. Whether it being my leather jacket, an oversized boyfriend coat or a camel trench coat, even a thick parka (especially when it's snowy) - I think all of these are must-have favourites; especially this year and I need to get my hands on them soon! TARTAN SCARVES. To me, it's almost the biggest tip off that the season has arrived when I see new tartans in the stores and it's official on that first day when I dig mine back of the wardrobe. I currently own two tartan scarves one being predominately white; with red and green accents and the other being green: with white and red. What I like is that using the same colours - I've got both a light and dark scarf. Recently I've noticed more using pinks and maroon shades too! Whenever I've worn scarfs in the past they've been plain and just a little boring - what I like about the tartan style, is that even if my outfit is hidden with my numerous layers, my scarf adds that little extra to my look!